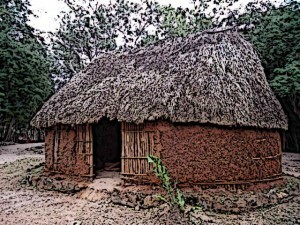 Mayan homes were mostly reflective of the social classes in Mayan society. Mayan homes were, for the most part, divided along the lines of the elite and commoners. The homes of the elites were larger, built with durable material and were often furnished with many things. The homes of the commoners, on the other hand, were built of inferior material, were smaller and had scarce furnishings. Mayan families lived in clustered homes so that a persons sons would build their homes right next to his home. Mayan homes were primarily of two types: homes built of stone and homes built with base materials such as mud. The former kind of homes belonged to nobility and were larger whereas the latter kind of homes were for commoners and peasants. The homes of the elite had stone walls and roofs and made use of different materials such as mortar to give the construction more durability. Mayan homes were mostly reflective of the social classes in Mayan society. Mayans often made use of lime to whiten the fronts of their houses. This was often done by the commoners who had houses with thatched roofs and walls of baked mud. The houses of the elite sometimes used sculptures on the exterior of their houses as a sort of decoration. Combed roofs were also used in some cases as a decorative feature. The interior of a common Mayan home consisted mostly of a single room where the family would sleep. Sometimes, artificial partitions were propped up to divide the room. The commoner houses were barely furnished, although they necessarily had plain pottery wares to be used for food. The sleeping area was usually reserved at the rear of the one-roomed houses and was set up with beds of sapling rods and mats. The elite houses were larger and were often furnished with many materials, including art items. The pottery items used by elite Mayan people was far more elaborate than pottery of the common people. The homes of the nobility also featured royal baths which were an extraordinary feature for the time. These baths comprised of large stones which were allowed to heat under the sun and then water was poured on these stones to turn it into steam. This was then used to take steam baths. Mayans made extensive use of limestone in their buildings. The building methods for the construction of commoner houses comprised of propping up a baked-mud wall. A thatched roof was laid over this wall, giving the house the shape of a hut. The roof was often made up of leaves or tree bark. The method for the construction for elite houses was different. Here, the material used was stone and the houses were often structured around a courtyard. Moreover, decorative elements such as sculptures and roof combs were also used to give the exterior of the building a beautiful look. One of the key materials used in the construction of elite Mayan homes was stone. Stone structures were generally built because they could last for a longer time and easily survived accidental fires. However, the use of stone as building material was limited to the rich nobility only due to the expense. Mortar was also used as binding material and for many other purposes in the homes of the rich. Mayans were able to develop an advanced method of creating mortar from limestone, since the latter was available in excess near Mayan cities. Members of a Mayan family each had a separate home upon adulthood. Most of them clustered together in the same area so that they shared a kitchen, garden and other areas. When a male Mayan grew to adulthood, he built his home near his fathers home. The peasant homes typically had a garden right next to the home which was tended to by the women while the men were away hunting, farming or fishing. The commoner houses in the Mayan cities were smaller and usually in the shape of huts. They were built using cheaper materials such as trees and mud although they were strong enough to withstand rain and temperature changes. Some commoner houses had stone foundations but these were very rare. Even commoners of a higher social status, such as craftsmen, had houses of a similar shape and structure. The commoner houses were typically clustered together by members of the same family so that they were able to share different aspects of the houses such as kitchen, garden and storage area. The interior of the commoner houses consisted of a single room where all the members of the family slept. The homes of the elite in the Mayan civilisation were not only spacious and luxurious in comparison, they were also constructed so as to show off the power and superiority of the nobles. The elite houses made use of more expensive materials, such as stones and complex materials such as mortar to make their homes rain-proof, fire-resistant and overall far more durable. These homes often included rooms which made use of advanced methods to allow steam baths. Typically, the houses of the elite were situated in the centre of the city near the Kings palace, although like the commoners, members of an elite family also made houses close to each other. Mayan homes were typically of two types: commoner homes and elite homes. Commoners were the peasant class of the Mayan society which often included skilled craftsmen. The homes of the commoners were built atop dirt mounds and comprised of a hut-like structure comprising of a single room. These structures were built with baked-mud walls and a thatched roof. The interior of the commoner homes were sparsely furnished. The homes of the rich on the other hand were built with better masonry such as carved stones and extensive use of limestone and mortar was made in their construction. These homes were furnished richly, including intricate pottery and art items. They were typically spacious and included rooms for steam baths.